STEP ONE - You must make sure JSON is installed as part of your PHP installation. THE MODULE WILL NOT WORK WITHOUT THIS. Go to the Elastix GUI in your Web Browser and login. 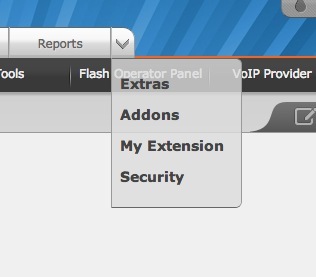 Then click on the PBX tab at the top. You will see the 'Unembedded freePBX' link in the lower left. Click on that. You can now go back to the PBX tab and click on the 'Unembedded freePBX' link. The standard FreePBX will open up with all options. Next, click on the 'Manage Local Modules' link. Scroll down to the Connectivity section of the page, click on the SIPTRUNK.com link then select 'Install'. Scroll back to the top and hit PROCESS. Hit the Confirm button and then Apply Configuration Changes. Once the key is added, it will securely communicate with the SIPTRUNK.com servers and pull all of your Trunk and DID information into FreePBX. Make sure to follow the on-screen instructions, and then hit the SAVE button, followed by APPLY CONFIGURATION changes. You should now see your trunks registered and outbound route properly configured in FreePBX! NOTE: MAKE SURE TO MOVE THE SIPUS OUTBOUND ROUTE TO THE TOP OF THE OUTBOUND ROUTES LIST IN OUTBOUND ROUTES SECTION! To manage your DIDs and associated Inbound Routes, simply click on the Trunk underneath 'Trunks and Telephone Numbers' in the upper right corner of the module. From there, you can set the inbound routes, save, apply and they will be pushed into the Inbound Routes section of FreePBX. In addition, if you make any modifications within the Inbound Routes section of FreePBX, they will also sync back to the SIPTRUNK.com module. If you have any questions on how to use the module, please open a Support Ticket for further assistance.